I've certainly noticed the uptick in Bristol punctuality - the number of text delay warnings I get has gone down significantly. Agree with that, and the improved performance seems to be continuing through January. No short-forms this week either on these services - though that's not long enough to call it a sustained trend. Thanks Ray does that mean that people with continuous season tickets are actually paying less year on year? I remember a period at the end of Thanes Trains and the changeover First ? taking over when for several years I paid lees each year for my annual season ticket around 2% rise and 5% discount. Never seems to get mentioned in reporting. My ticket despite the 5% or 10% has nearly always cost me more. I wished I was better at maths to understand why. Another mostly positive set of results after last months distinct upturn. HSS Punctuality was up to 90.6% which is the best result since April 2016, and with Reliability at 99% I guess that's evidence that the IETs are starting to settle in? All other punctuality scores were up on last month as well, except for LTV which dropped back a little. Reliability didn't show quite such an impressive set of results, with drops on 4 or the 6 sectors compared with last month, though they were mostly slight drops. That's except for Plymouth & Cornwall which recorded just 97.6, no doubt due to the Penryn derailment. That was enough to drop the Moving Annual Average from 98.7% to 98.5% which is the trigger for season ticket discounts. Thanks. So why is LTV still performing poorly? The 387s have been around for a year now on the outers (and longer on the suburban services). Is it just the seemingly frequent infrastructure issues at the London end of the route? Issues with the timetable? Something else? I could make a (probably ill-informed!) guess that the problem is timetable related, and a further observation. If you look at that most complicated current GWR timetable, T10, you will see a very complicated set of different calling patterns all running between Paddington and Reading, and an uneven spacing of services with "bunching". Many leave or arrive at the same station close together, so delay on one service affects others. To give two examples - there are 3 services close together through Goring each weekday morning towards Reading - a 7-45 (stopping electric to London), 7-55 (stopping diesel, Oxford-Reading) and 08-00 (electric limited stop after Reading for London). The first is often late, and almost invariably the others are delayed following. There are then gaps of 18 and 28 minutes respectively between the next two services. In the evening there are a number of limited stop departures that pass earlier slower trains before reaching Maidenhead, then stop there and Twyford just or so three minutes before the slow service they have overtaken, so it does not take much slippage in timings to get two late trains for the price of one. Perhaps (if it is possible) reworking the Paddington - Didcot timings so that timings west of Maidenhead are evened out might help? The second factor is the splitting of trains at Reading - a particular problem with a train I often get when I change at Reading, the 16-57 ex-Reading stopping service for Didcot. It arrives as a lightly loaded 12 coach train, then divides. leaving 4 behind. It seldom arrives at the advertised 16-53, and usually takes longer (sometimes much longer) than the allowed 4 minutes to divide, often ending up 10 minutes or more late at Goring. Surely someone could work out a way of avoiding this delay? Back down to 5% discount for Thames Valley. Seems a poor deal for the traveller considering how bad the service has been over the last year. Yes, it was 10% for ten consecutive months, but reliability is now 0.1% above the trigger level for the last two periods. The much fairer adoption of the Delay Repay method is just around the corner still we hope! While generally my trains are running on time, I'm finding lots of the Taunton/Cardiff or Weston/Parkway services I catch are running short formed. Not quite rammed but it is definitely standing room only on many of these where as previously they had a third unit. 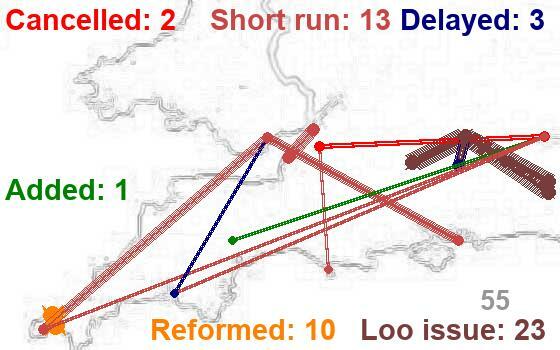 While the engineering works are ongoing west of Exeter, some of the Cardiff - Taunton diagrams have been modified. The very busy 0800 Cardiff to Paignton usually starts out from Exeter, but for the last 3 weeks that is has been a Bristol-based set it has apparently been planned as a 2-car 150 instead of the normal 3 carriages. And that one is most definitely rammed between Newport and Bristol. To make matters worse, that unit later forms the 1508 Taunton to Cardiff which passes through Filton Abbey Wood at 1632 and is again ram packed between there and Newport. It's as if the train planners responsible for short-term changes to train diagrams don't make use of typical loading figures when allocating stock. Since the start of the year, I think all the CDF - TAU diagrams that are not going to or coming from places further west are supposed to be 3-car (150/0 or 166). The 2nd half of January and first half of February short forms seemed relatively scarce, but maybe it was premature to claim an improvement. And without the 153s available to augment the 150/2s I don't suppose it's going to get much better until the rest of the cut-down HSTs arrive. The latest graphs are attached covering the period up to 2nd March. The upward spike in punctuality, and to a lesser extent, reliability, continued. HSS posted the best set of punctuality figures for three years at 91.9%, well above the target levels. LTV posted the best results since September '17. Wales to the South Coast and Bristol's were the best since April '17. Many of the MAA's rose quite considerably as a result, though all penalties still apply from the previous period and the Devon figure slipped back to 89.1%, only 0.1% above the 5% season ticket trigger. Another good set of results last period, saw HSS consolodate on their recent improvements with a 93.0% Punctuality score, second best since then end of 2015 when I started keeping data, and a Reliability score of 99.7%. That Reliability score was enough to take it out of the charter discount trigger with the MAA (Moving Annual Average) rising to 98.5%. Just a 5% discount now applies. Other sectors also recorded good results with LTV Punctuality at 85.6%, the best for over two years, and most other sectors improved or maintained the better results we've been seeing since late last year. The only dip of note being Bristol Punctuality which at 89.0% was around 1.5% lower than the previous three months - that's still over 9% better than the same period last year so saw the MAA still rise healthily by 0.7%. With details of the new timetable from December slowly emerging it will be very interesting to see how the sectors, HSS especially, perform in the run up to its introduction and the period after when much of the current slack due to the improved performance of the new trains is removed.